Use Newclay Hardeners to speed up drying and improve the durability of Newclay™ or Claydium™ models. Two versions are available. 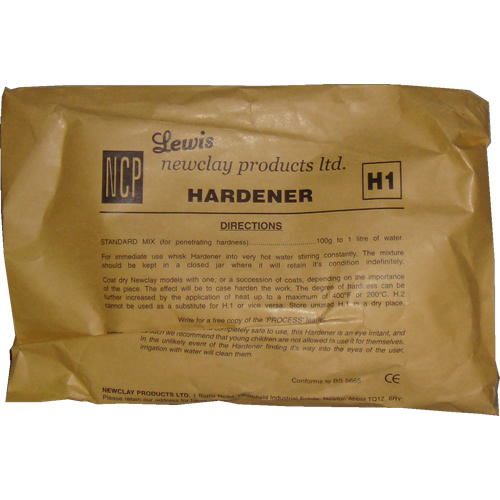 Newclay Hardener H1™ is supplied as a powder, which is dissolved in hot water and the solution applied onto a Newclay™ or Claydium™ model once it is dry to give the article a surface or “case” hardness. Additional coats can be applied as required, depending on the importance of the work and the degree of hardness required. For immediate use whisk Hardener into very hot water stirring constantly. The mixture should be kept in a closed jar indefinitely. Coat dry Newclay models with one or a succession of coats, depending on the importance of the piece. The effect will be to case harden the work. The degree of hardness can be further increased by the application of heat up to a maximum of 400°F or 200°C. H2 cannot be used as a substitute for H1 or vice versa. Store H1 in a dry place.